Microgravity has profound effects on the human body and on cells within the body, and insights gained from research conducted onboard the International Space Station (ISS) National Lab are helping to advance the field of regenerative medicine back on Earth. 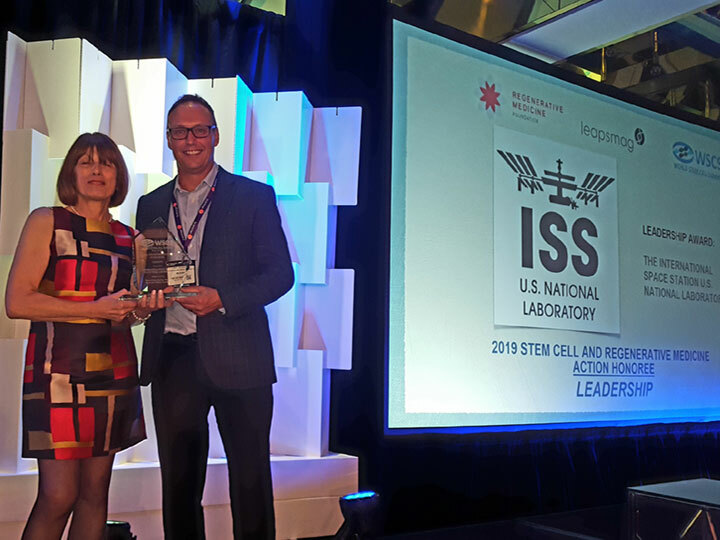 In recognition of its leadership in enabling valuable stem cell and regenerative medicine research, the ISS National Lab was presented with a Leadership Award from the Regenerative Medicine Foundation at the 14th annual World Stem Cell Summit this week. The unique environment of the ISS National Lab allows researchers to study cells in ways not possible on the ground. Microgravity affects the way cells aggregate, allowing them to form into three-dimensional structures that more closely resemble tissues in the human body—providing improved models to study cell behavior and test drugs and accelerating advances in tissue engineering. Microgravity may also enhance some properties of stem cells, such as their ability to survive, proliferate (increase in number), form 3D aggregates, and differentiate (develop from general-purpose cells into specialized cells)—which could provide significant benefits in advancing personalized medicine and developing stem cell-based regenerative therapies. Tissue chips, small chips containing cells grown on an artificial scaffold to model the detailed physical structure of human tissue, have the potential to revolutionize medicine and are now being leveraged on the ISS National Lab to enable improved disease modeling and higher-accuracy testing of potential new drugs. Soon, scientists may be able to manufacture human organs and tissues on the ISS National Lab for use back on Earth using the 3D BioFabrication Facility, which is being developed by Techshot and is scheduled for launch on SpaceX’s 18th commercial resupply services mission. ISS National Lab-sponsored requests for proposals have provided grants that support use of the space station to advance stem cell and tissue chip research. In addition, the ISS National Lab has collaborated with the National Center for Advancing Translational Sciences and the National Institute of Biomedical Imaging and Bioengineering—both part of the National Institutes of Health—to support tissue chip research on the ISS National Lab centered on human physiology and disease. The ISS National Lab has also partnered with the National Science Foundation to support transformative tissue engineering research on the ISS. Later today, the final plenary session of the World Stem Cell Summit will focus on “How Space Technology and Microgravity Will Lead to Profound Benefits to Human Health on Earth,” and several ISS National Lab investigators will speak about the opportunities they have had to leverage the ISS National Lab for valuable research aimed at advancing stem cell biology and regenerative medicine to benefit life on Earth.